Free Field Technologies (FFT), an MSC Software company, announced today the release of Actran 18. The new release offers new capabilities for achieving superior performance in acoustic, vibro-acoustic, and aero-acoustic simulations. Driven by ever increasing acoustic performance expectations, industry requirements call for highly performant acoustic simulation solutions that can be easily deployed in any environment. Actran 18 delivers cutting edge technologies addressing these requirements for a large variety of vibro-acoustic and aero-acoustic applications in industries as diverse as automotive, aerospace, railway, defense, and consumer goods with a more efficient graphical user interface. Modeling – Two new simplified trim component modeling approaches aim at answering the increasing need of the automotive and aeronautic industries for acoustic treatments with optimal NVH performances. The meshing effort required to model acoustic trim components is drastically reduced which enables the integration of trimmed body models in optimization studies. By combining the proven aero-acoustic technology of Actran to the powerful DGM solver, FFT engineers have built a tool that is now able to compute large aero-acoustic problems efficiently, based either on unsteady or steady CFD results through the SNGR method. 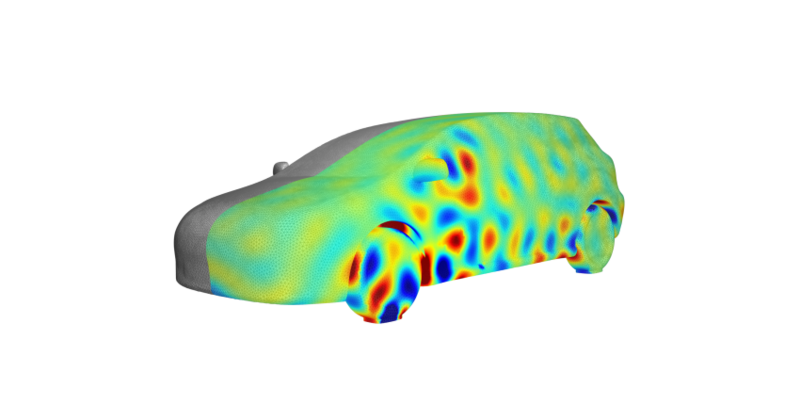 Thanks to Actran DGM remarkable CPU and GPU scalability, this association opens the door to large scale and high frequency aero-acoustic modeling, such as the wind noise around a complete car or train coach. Simulation – The Non Parametric Variability Method (NPVM) has been extended to modal components and super-elements in a direct frequency response vibro-acoustic analysis. Robust design and impact of model and manufacturing uncertainties on the vibro-acoustic response of a structure can therefore be evaluated seamlessly by activating a single parameter in the analysis. Fan Noise – Can now be evaluated using simplified or complete approach. A simplified approach based on analytical rotating sources is particularly useful for studying the effect of design changes early in the design process. A more complete approach based on an unsteady CFD simulation is used to validate the acoustic performances of any axial and centrifugal fan included in electronic devices and HVAC systems. Extensibility – On the computational performance side, the extended mesh adaptivity, the new interpolation order adaptivity and improved algebraic solver technologies provide significant time/memory reductions across a wide range of applications. A new wizard for acoustic radiation applications is introduced to support the acoustic radiation core capability of Actran. The wizard guides both beginner and experienced users through the pre-processing steps of acoustic radiation models. The solving of these models was also improved significantly with up to 2x computational time gain and memory reduction.